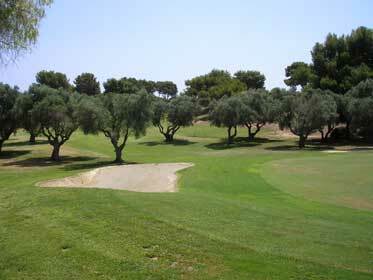 Villamartin, guide to the golf course and urbanization on Spain's Costa Blanca. Villamartin Costa Blanca Spain - Situated at the southern end of the Orihuela Costa region of the Costa Blanca, Spain, the golf course and golf urbanization of Villamartin sits alongside two other golf courses of Campoamor and Las Ramblas. Certainly the most popular of the 3 and generally recognised as the finest of the courses Villamartin played host, in 1994, to the Mediterranean Open, taking its place amongst the best of Spain's golf courses. The well deserved winner in that year was Spain's own José María Olazábal, and although the tournament was no longer held after 1995 it established Villamartin as a championship golf course, and it has continued in this tradition. There are several commercial centres in Villamartin offering a wide choice of bars, restaurants, cafes and shops, the main centre is beside the first tee and clubhouse of the golf course, and is known as Villamartin Plaza. The Plaza boasts some of the finest restaurants in the area, and offers a unique dining experience. Villamartin is located just inland from the Orihuela Costa coastal resorts of Cabo Roig, La Zenia, Playa Flamenca, Punta Prima and Campoamor and is just a 20 minute drive from the airport at San Javier (Murcia), a slightly longer drive but just as easy is Alicante airport at about 45 minutes. Villamartin is clearly signposted from the N-332 coast road at La Zenia and at Campoamor, if accessing via the AP-7 motorway get off at the La Zenia junction (SEE MAP). If you are planning a trip to Villamartin then you will be looking for accommodation in the area, whether it be for a golfing trip or a holiday. The Villamartin area is not blessed with a great selection of hotels, but it does have a wealth of self-catering accommodation, in the form of villas, houses and apartments, many available to rent direct from the owners, thus cutting out agents fees. Due to the excess of properties, you can get some pretty good accommodation deals, and you will find that holidays in Villamartin can prove to be very cheap. A villa with its own pool or an apartment with a communal pool would be a good choice and we often feature some suitable properties on this page (see below). Remember that Villamartin is not within walking distance of a beach, so having access to a pool is a must during the hot summer months (SEE TODAY'S WEATHER).